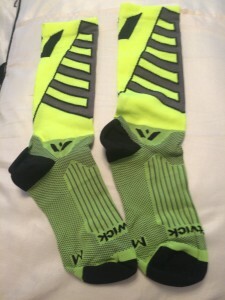 Swiftwick Vision Mid Calf Sock for Her: Taking care of the feet that get you to your fitness goals. FROM NOW UNTIL DECEMBER 21, 2015 – CHECK OUT THE DETAILS HERE. Hi! You may remember me from my earlier articles where I shared the story of my First Mile and surviving the desert winds in the 2015 Rock ‘n’ Roll Las Vegas Half Marathon. Well, you may also notice that I am no longer writing as a guest contributor, as I am now a member of Team Casual Runner! When Casual Runner asked me to join the Team, they told me that I would have to be OK with getting out of my comfort zone when it comes to trying out new fitness gear. But here’s the thing, anyone who runs long enough has no choice BUT to get out of their comfort zone when it comes to fitness gear. Seriously, manufacturers are always changing their designs to keep up with market trends, which means once you find something that works for you, it may not be around the following season. This goes doubly for the ladies. We all have unique aspects to our body shapes that make certain product designs work better for us than others, and some that flat out don’t work at all. So, adaptability really is the key to finding new gear that works for you. Case in point, I have been searching for the right pair of running shoes for the past 6 months. I just can’t find what works for me, they all have something that causes me discomfort, especially on my longer Walt Disney World Marathon training runs (remind me: who thought that it was a good idea to enter the Goofy Challenge?). Since I cannot settle on the right pair of running shoes, at a minimum I need to find the right pair of socks. Let me stress that: I NEED to find the right pair of socks. If I am going to be annoyed by ill-fitting running shoes, I definitely cannot be bothered with socks that compound my annoyance. 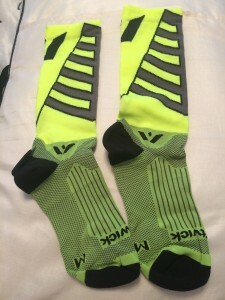 Yesterday, Mike shared his thoughts on Swiftwick’s Vision Mid Calf Socks, but that was from the guy’s perspective. I wanted to let the ladies know how these socks work for us. And yes, I mean the women’s version of this design, we are giving women their fair due here on Casual Runner. If you want some more background info on Swiftwick, feel free to check out Mike’s article as he covered all the bases. What I want to do is tell you what I was looking for: a great pair of socks that works for me. To do that, I have a few simple criteria. First, the socks have to be comfortable. If I notice the socks when I run, they will annoy me, which is no bueno. Second, absolutely no blisters. Is that too much to ask? I don’t think so. Third, wick away! 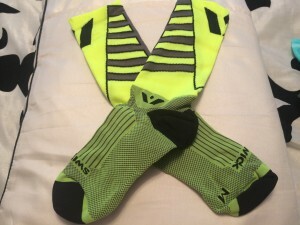 I do not want my socks to make me sweat more than I already am, and I definitely do not want to have my socks be soaked at the end a training run or race. Fourth, for a mid calf sock, will you please stay up on my calf? Every single pair I tried out falls down. Which, is not only annoying, but fails my first criteria (come on folks, that was comfort, please try to keep up). Fifth, they have to look good. No old white gym socks with 1980s off-colored stripes for this girl. 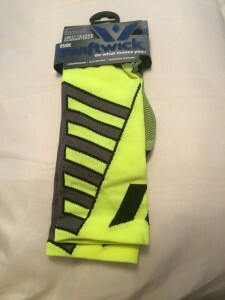 Ok, so let’s see how the Swiftwick Vision Mid Calf performs. Comfort. The first thing you notice about these socks is how comfortable they are. From the minute I took them out of the packaging, and after several long training runs and several wash cycles, these socks were factory fresh and remained super comfortable on my feet. Blister free! A result of the comfortable fit is that I did not experience any adverse rubbing and zero blistering. This is huge as, especially with the unique shapes of women’s feet, we all need athletic socks that conform to our body shapes without any bunching or pinching. These socks allowed my feet to breathe while providing great support. Wick away! These socks worked as advertised. My feet were able to breath easily, which meant no weird sweating and my socks were relatively dry at the end of my runs…except for maybe some spilled sports drink, but that is bound to happen during training runs and races. And I doubt Swiftwick makes a sock that can stop us from spilling our drinks while we run. THEY STAYED UP! Now this is the one I could not believe: mid calf socks that actually stay UP on your mid calf throughout the run? I know, what a concept! This may have been the best feature of these socks as they did exactly what they say they would. Do not overlook the significance of this point -not once did I have to stop to pull up a sock that was falling down my leg or have my stride impeded by ill-fitting or moving/dropping socks. I think this may be the highest praise I can give. Fashion forward. Jennifer and Jake are not the only Team Members now who love running in costumes. Now that I know that Swiftwick has some great designs in a variety of colors, I know that I can play around with some combos that will work for future costuming ideas. So, watch out for those. Needless to say, I liked these socks. They worked well for me and satisfied what it is that I am looking for in a quality running sock. Their quality is noticeable and they stand up to abuse, both out on the running trails and in the laundry cycle. Now that I found socks that work for me, I just need to solve that shoe puzzle! Neither Candace nor Casual Runner received any compensation for this review. The product reviewed herein was provided by the manufacturer for purposes of this review and the opinions are solely those of the author.